Rose in Thorns: One day to go! It's nearly here – A Craft Affair hits town for the very first time tomorrow! I have been very busy making lots of candles. There will be some new, never been smelt before fragrances on offer in my new soy candle range. They will be available in three different sized tins, tealights, and of course, in teacups too. I have also been very busy putting together something new. But I won't say what it is or post a picture here – you'll have to come along tomorrow if you want to be the first to see what it is! If you do come along tomorrow, don't forget to bring your old candles along for me to recycle. In return you will get a 10% discount on your next purchase! You can choose to spend this tomorrow, or keep the coupon for a later date. There are plenty of good reasons to come, including free entry, cupcakes, the best hot chocolates, and of course lots and lots of fantastic handmade items made by some very talented crafters. 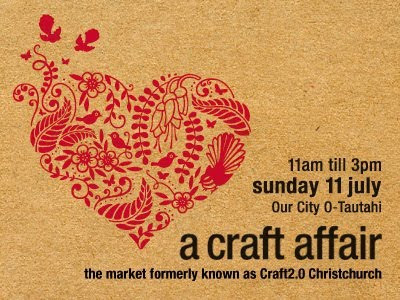 A Craft Affair is on from 11am till 3pm, Sunday 11th July at Our City O-Tautahi, corner of Worcester Boulevard and Oxford Terrace, Christchurch (the old information centre, right next to the bridge). I hope to see you there! Shame I can't make it tomorrow Rose (I'm teaching). I hope you have a fantastic day! !